National Broadband Network users who choose to pay thousands of dollars out of their own pocket for a high-speed internet connection are inadvertently paying to upgrade their neighbours' connections as well as public infrastructure, the ABC has learned. 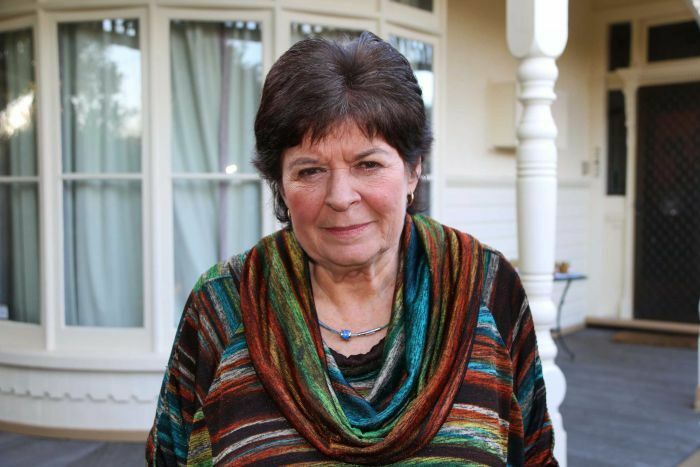 Charmian Gaud decided she needed a faster internet connection at her Williamstown home, in Melbourne's west, than the NBN provided fibre to the node. She paid $6,500 to have her home hard-wired to the NBN connection point about 80 metres away from her house. The option is available for people who want FTTP, but do not live in an area earmarked to have it rolled out for free by the NBN Co.
She was surprised to be told by the installer that the five homes in between her house and the connection point would now be able to get FTTP connections to their homes at a much cheaper price, as she had paid for most of the necessary infrastructure. 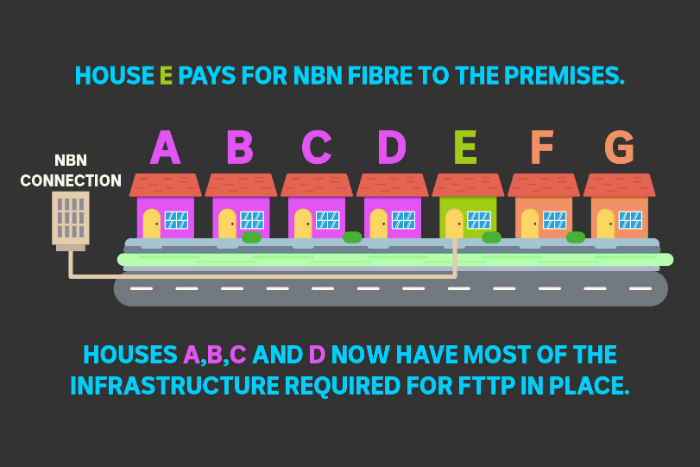 The ABC understands these houses would now only have to pay about $2,000 to connect to NBN fibre. "I was quite angry — that's just not fair you know," Ms Gaud said. "You've essentially been asked to pay for street furniture. You have some ownership because you've paid for it … but you have no rights. That's how I feel about it." Homes that are on the other side of her house, further away from the NBN connection, will also get a discount because the infrastructure is now partly built at Ms Gaud's expense. A representative from NBN Co confirmed that the first person who funded a direct NBN connection in their area would bear the majority of the cost. "Because the fibre is now in the locality there's a good chance the price will be cheaper for the second applicant," he said. He said if people in the same area came together to fund the fibre connection to all their homes at the same time, their individual costs would come down. But adding salt to the wound for Ms Gaud is the fact she tried to get her neighbours together to make a group FTTP application to bring the costs down. Over several months, she doorknocked dozens of neighbours and dropped leaflets in their mailboxes to encourage a group application. She had four households who were interested, but when they received a quote of $14,000, the others in the group decided not to go ahead. Ms Gaud decided to forge ahead alone because she believed it would improve the value of her property and deliver faster internet speeds. "Personally I thought it was better to go up to fibre-to-the-premises to have something that's reliable and future proof," Ms Gaud said. She is frustrated that these same neighbours will now be able to get the NBN more cheaply if they choose to go ahead with FTTP. Ms Gaud believed if other homes in her area proceeded with building FTTP and utilised some of the infrastructure she's already paid for, she should get a partial refund. She said the same should apply if NBN Co or subsequent governments decide to upgrade the infrastructure in the area at no end cost for users. "The components that are on the street … I think there should be a contract on that, and then if someone else uses that there's actually a refund to the person who's started it out," Ms Gaud said. But NBN Co said that would not happen. "The Tech Choice program is operated entirely on a cost recovery basis by NBN Co, it is not designed to operate at a profit," the company representative said. "We have no plans to introduce a refund mechanism to the Tech Choice program at this point." 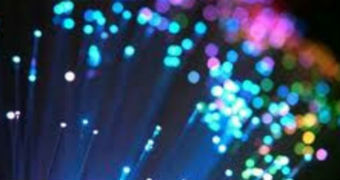 All homes will be connected to the NBN in some form by 2020. 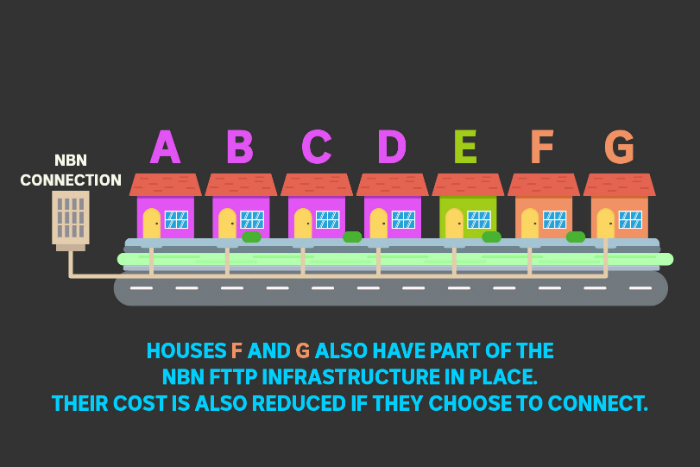 In some areas, NBN Co is building FTTP, but in most it is only building fibre to the node (FTTN) or fibre to the curb (FTTC), which utilises some of Australia's ageing copper network or cable television lines. In other more remote areas it is using NBN fixed wireless and Sky Muster satellite services. People can choose to upgrade to FTTP at their own expense — the most costly to be built to date is $217,800 at Shaw in Queensland. Quotes for the hard connection have even gone beyond $1 million.